Despite the cat already being out of the bag on the new 2010 Ford Taurus, Ford's furiously trying to shove it back in, covering up the new Ford Taurus in all sorts of anti-spy camouflage. And though the sedan is covered and padded to the extreme there's still a lot to learn from these photos. The front bumper appears to have more detail than the previously snapped Taurus, suggesting that wasn't a final product. There's also a tester running around with dual exhausts, which could mean EcoBoost, or Heavens to Betsy, a 2010 SHO Taurus! Like Mulder, we want to believe. Full spy report below the jump. 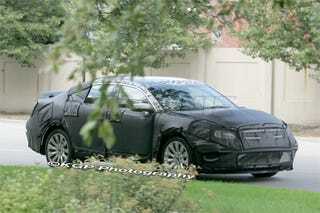 Here are some shots of Ford's invigorated 2010 Taurus, caught testing in Detroit. This new Taurus is what the car should have been all along, according to Ford's CEO Alan Mulally. Although the car is very heavily camouflaged, the prototype definitely looks related to the camera phone shots of a purported Taurus clay model, which leaked earlier this year. We think we can see some differences on the front bumper—around the fog lights—suggesting that the finer points of the 2010 Taurus' design were still in flux at the time the photo was snapped inside Ford's Design Center. We have seen photos two different prototypes—with single exhaust and dual exhaust. The dual exhaust set-up likely points to the Ecoboosted 3.5L V-6, which will produce 340-hp in the Lincoln MKS.